growing your practice and making more money! …and now the real work begins. Because it's only once you're in practice you realise how little you were taught about how to get patients, generate referrals or create marketing that works. In fact, if your lecturers were anything like mine they hadn't a clue about building a successful practice – which is why they were being paid you to teach rather than running their own clinics! ...because none of those guarantee success. Of course it helps if you’re good at what you do but that doesn't guarantee you'll be busy. Unfortunately there's a lot of practitioners who are crap yet still have more patients than their skills alone should attract. I’m sure you even know a few of these yourself and you may have even graduated with some of them. You know the ones, some who barely know which end of a reflex hammer to hold let alone where to tap – yet still they're busier than you. Because now’s your chance to get the patient numbers you deserve - because with your skills and what I'm going to share you'll have more patients than you'll know what to do with. You see with the right information it's very easy to have more patients, more referrals, more money with far less stress and worry - and give them better service! Before I explain how all this is possible let me briefly tell you about myself, why you should listen to me and why I'm so negative about the majority of clinics I see today. I've been in practice for almost 26 years, growing my practice continuously through the recession of 1990-92 and this present one. I'm at the stage where, in my late 40s, I now work part-time so I can do the other things I really want to... in fact, I was away from my clinic four times last year holidaying and lecturing and my clinic still grew. It's fair to say I'm pretty good at growing and building practices usually in just months. ...it has everything to do with how they market themselves, attract new patients and keep their existing ones. Do that well and you flourish – do it badly and you struggle. Don’t you deserve to have the practice you want? You see, you'll never be as successful as you could be if nobody knows about you and your unique skills. I f people don’t know about you, your expertise, the fantastic service you provide – they will not come! So, what are you left with? Building your clinic via “word-of-mouth” which may take years - years you may not want to wait. Hoping and Praying one day you'll get the patients and recognition you deserve? Travelling from one technique / practice building seminar to the next? Spending all your time and money on Google adwords, Facebook, Linked In or the latest shiny object? Now there is a way to super-charge growth and get busier straight away! Let me tell you about the Exponential Practice Growth system. Last year, I s aw 478 new patients working only 1248 hours… that’s a new patient roughly every 2½ hours and this figure has risen for the last six years. My clinic is busier since my associates left than it was when they were with me! This year I’m on track to do even better - and I want you to as well. …the twist is each time they send someone I increase the value of the gift I send them. I’ve sent lottery tickets, cinema tickets, gift vouchers and even paid for them to be wined and dined at a restaurant of their choice. The most expensive meal I paid for was just shy of £100 but that was to someone who had referred me over £1000 (yes one thousand pounds worth of new patient consultations not counting follow up treatments) – and they’re still referring. I’ll share with you how to get as many patients as you want via referrals and word of mouth. In fact, there's an entire module covering ten referral techniques you should be using. And another module on how to reactivate old patients and get them flooding back in to your clinic. Why advertise if you don't need to - and if you don't need to you've already saved money! another module covers the importance of advertising and how to easily double the effectiveness of your Yellow Pages ad. Do this correctly and you ’re made for life - do it wrongly and you are just throwing money away! And yes, Yellow Page adverts do still work you’ve just got to do them right. simply by modifying what you already do! I've just increased my fees by 16 percent and got busier. This is the third time I've raised them in 5 years - they are now over 30% higher than they were before! Other practitioners increased their fees by even greater percentages - and got even busier! In the Exponential Practice Growth system you’ll discover why you should be charging more and how to do it so you don’t lose any patients. More importantly you’ll find out how you can guarantee what you do so prospective patients want to come and see you. You see, your prices can only be compared with your competitors if you do the same things they do and do them the same way. But it isn’t difficult to increase the perceived value of a treatment at very little cost. Run your clinic so differently (and so much better) that direct comparison between you and any one else is impossible… Then you can charge what you like and people will gladly pay it. It's easier than you think to make your clinic stand out: Keep your schedule running on time, have a water cooler for free drinks, have free fruit available to patients, pay for their ticket when they park their car, give away free samples of gel / oil /etc. These things cost pennies to do but they make you noticed - and they make patients refer! Creating a “WOW” factor in each treatment is extremely easy to do but doing so makes patients happy to pay the additional increase in your fees. Your clinic is sitting on a goldmine. No matter how long you’ve been in practice you’ll have filing cabinets full of patients who are no longer under active care. You’ll discover various steps you can immediately get them back under active car e including reactivation letters you can just copy and send and away you go. So why am I am telling you this? If you can get more new patients in the door, keep them (and your existing ones!) under care for longer and rightfully charge more for what you do - then you're made for life! I share with you everything you need to get more visits per patient, more patients and a higher fee. And, the important thing is I show you how to do this ethically and (excuse my language) without taking the piss exploiting your patients. Everyone's happy and everyone wins! Postcard marketing – postcards are a fantastic and under-utilised way to stimulate interest to not only to maintain contact with current patients but to reactivate inactive ones. I show you everything you need to do postcard mailings that never fail to get patients into your clinic. You'll also discover how to develop a marketing calendar that keeps you busy all year long by pulling all the techniques you uncover in the Exponential Practice Growth programme together. This means you avoid the peaks and troughs of patient numbers your colleagues will suffer from whilst your appointment book stays full. This section comes complete with a 12 month sample marketing calendar, a DVD recorded live from a $2000 seminar showing step by step how to use all the ideas you discover. It even includes a blank calendar for you to plan your own year of success – you really do get everything you need to keep you busy all year round! You'll also find out how to get the most from your website by correcting the 10 most common mistakes most sites make. Simply checking for – and correcting – these will prevent you losing visitors, patients and money. Just improving the look of your site can get you more patients even if you do nothing else(and if you don’t have a website I'll show you how to get listed on Google without one ). The Exponential Practice Growth programme also shows you how to develop effective clinic brochures and newsletters and how to get the most out of FREE publicity. Follow these simple steps and you will become the expert people turn to. Your business cards must create an effective first impression and promote your practice– but do they? We'll cover everything needed to design your business card to successfully pull patients in and convince any prospective patient to become an actual patient . You'll also discover how to create a niche so you are not troubled by competition. You need patients to recognize you as the expert in your field and I'll show you how to do just that and how to charge accordingly for it. It's getting to the point where everyone is trying to undercut each other. You can see this already with Groupon where treatment fees are constantly lowered but you'll learn how to increase your perceived value, increase your status and increase your fees so you are not caught in the “in-fighting” other practitioners seem so keen to enjoy! you'll keep getting what you have always got! Only you know if you're at the stage in life you want your practice to be at - and only you can tell if you deserve more. If you do, then start doing things differently. The Exponential Practice Growth will increase the number of patients you treat , the number they in turn refer and the number of reactivations who flood back. You'll find out how to become recognised as the expert you are and how to charge more because of that. You'll discover so many ethical and easy ways to dramatically improve what you're doing now you'll wonder why you never implemented these ideas before. I know that's a bold claim but it's one that's backed by a full money back guarantee! These ideas have worked for me and for hundreds of others who have used these strategies and watched their practices explode with growth. That's why I don't hesitate to offer my “pit full of piranhas, look me in the eye” money back guarantee. If you don’t think what you discover in this programme is worth swimming naked through a pond full of piranhas for, and you can honestly look me in the eye and say it didn’t benefit you – return the material and I will refund your money no questions asked! For only £180 (and without losing time from your clinioc travelling and without the expense of staying in hotels!) the techniques used by other practices to create their dream clinics can be yours too. If what you discover gets you just one new patient you will cover the cost of your investment. The Exponential Practice Growth file crammed with practice building tips, strategies and marketing know-how guaranteed to make your clinic busier. Everything is presented in short, distinct, easy to absorb and implement modules allowing you to acquire the information and apply it in just minutes (for a more detailed breakdown of the contents click here). Each module has its own action steps for you to follow that will further short-cut your time to success. Just read the module and follow the action steps - what could be simpler? 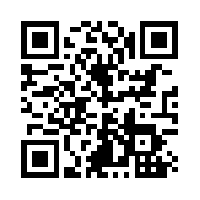 White Paper One: How to use QR codes to make any advertising message dynamic and really stand out. You may have already seen the images in various adverts but only a handful of practitioners are using them to build their clinics. This bonus shows you how to be one of the first to have them effectively build your clinic – and it shows you how to do it for FREE. White Paper Two: Reports are excellent practice building tools. They position you as the go-to expert and build you an extremely responsive list of eager patients... but only if used effectively. This extra bonus gives you all you need to produce your own reports that set you apart and getyou noticed. White Paper Three: Any one who has been in practice for a while will have filing cabinets full of inactive patients - patients who are no longer receiving regular care. In this supplemental report I will show you a couple of completely new techniques to “ethically bribe” them into restarting their treatment. These ideas have never failed to attract new patients, re-activate old patients and turn a profit - and they won't fail you! I teamed up with top marketer, Robert Boduch, to bring you three more exceptional bonuses. Robert is a marketing expert / genius and having twisted his arm (and given him oodles of cash!) I bought the reprint rights to the following books and have included them as another fantastic addition to this programme. …losing you potential patients and profits! 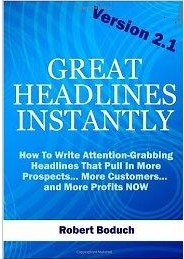 This is all you need to create attention grabbing headlines and introductions every single time you write. 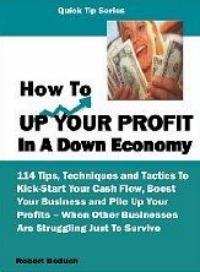 How To Up Your Profit In A Down Economy. In this book you’ll find over 100 tips you can use to build your clinic fast. It doesn’t matter how well you're doing and how successful your practice is, you can do better... MUCH better. Don’t be a victim of any economy! Simply follow the strategies outlined here and profit in spite of recession and hard times - and if times are good (like the politicians keep telling us!) you'll do even better. 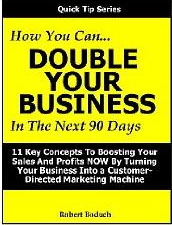 How To Double Your Business In The Next 90 Days. This simple, straight-forward and easy-to-follow guide reveals low-cost methods and market-tested tips to give any clinic a continuous flow of new patients and more cash. This book is a must read for any clinic owner! Covering the key concepts to boosting profits it turns your clinic into a patient -orientated marketing machine – easily and ethically. so you can actually hold, it read it , make notes on it, value it and put it to use! There's no point in opening your clinic and just hoping for the results you want. Now you have everything you could ever need to excel and achieve the patient numbers, results and lifestyle you deserve. You have nothing at all to lose and everything to gain just by trying it! PS: The materials in this programme, white papers and other bonuses will grow your practice. In each individual module I’ll show you, guide you and give you step by step pointers to implement immediately to get more clients right away. Over 25 years of practice building know how has gone in to this programme. Nothing has been left out – all and it's all been thoroughly tested and fine tuned - so you get everything you could possibly need is in just one programme. PPS: The Exponential Practice Growth is backed by a complete money back guarantee – so there is nothing to stop you implementing these powerful strategies straight away. PPPS: Most importantly - the Exponential Practice Growth programme is updated whenever new ideas and strategies are developed that work. I still attend all the seminars and read the books so you don't have to! Whenever I find something that is working it is added to the programme and emailed to you so you are constantly up to date with the best techniques and strategies.